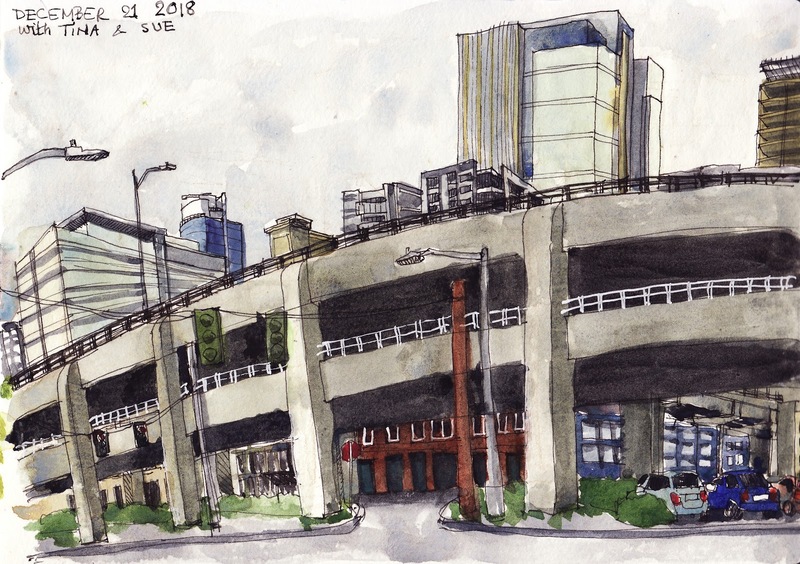 As you can gather from Tina and Ellie’s posts, urban sketchers have not escaped Seattle’s obsession with the Alaskan Way Viaduct and its closure. Yesterday we witnessed the “end of an era” final act: the new SR 99 tunnel officially opened and pedestrians had a unique chance to walk the new tunnel and the old dingy-with-oh-so-beautiful-views-viaduct before its final demise. 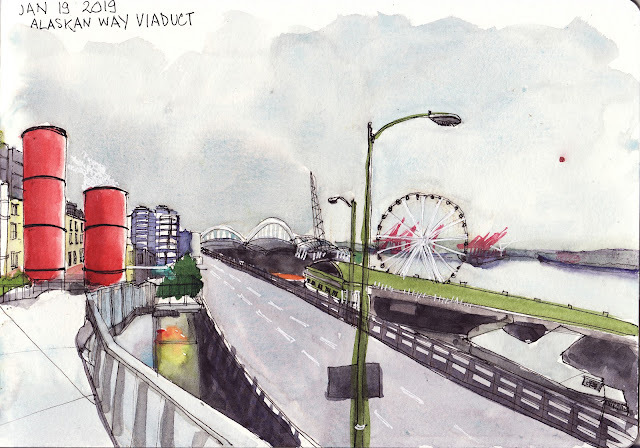 Some of us have been sketching the viaduct for the past couple of months. I found its dark grey ugliness mesmerizing. 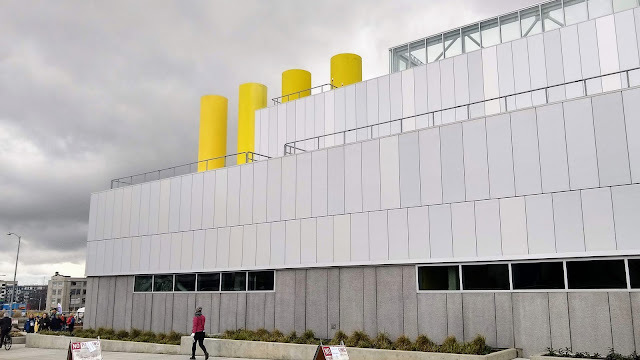 Since I moved to Seattle, 3 years ago, I’ve been fascinated by the city’s contrast of beauty and ugliness: the Olympic Sculpture park and the corporate buildings of South Lake Union; the snow-capped mountains at the horizon and downtown’s ubiquitous construction zones; the beautiful waterfront and the ugly viaduct. 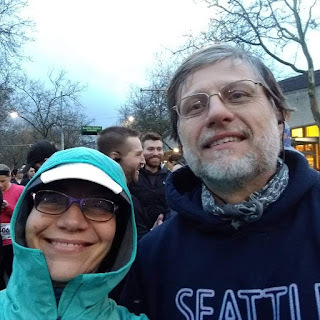 My Viaduct/Tunnel celebration day started at 6:30AM on February 2nd, when I took the bus to the Seattle Center to run the Tunnel to Viaduct 8K race. 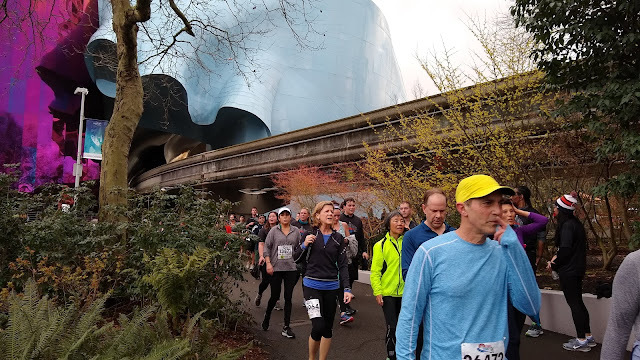 The race, as the name suggests, ran down through the new tunnel, up to the viaduct, down the old tunnel, and ended by the Seattle Center. It was the most crowded race I’ve attended in Seattle: 25,244 walkers and runners completed it (for comparison, less than 5,000 finished the Seattle Marathon and Half marathon this past November). There were also a record number of selfies taken in the tunnel and on the viaduct. Runners making their way to water and food at the end of the Tunnel to Viaduct 8k Race. After the race, I sketched the view at the Seattle center as seen after crossing the finish line. 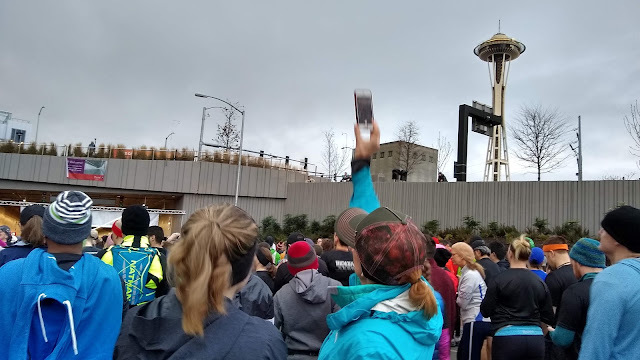 Throughout the day, 100,000 people showed up to walk the viaduct goodbye and to welcome the new tunnel. 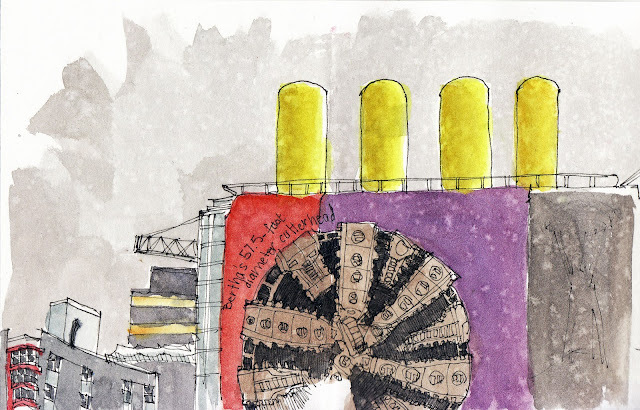 Before bowing to exhaustion and going home, I sketched a large image of Bertha hang on the tunnel operation buildings, which also features the four iconic yellow ventilation stacks. Bertha, the “world's largest earth pressure balance tunnel boring machine” was manufactured specifically for the SR 99 Tunnel and has cool steampunk look. 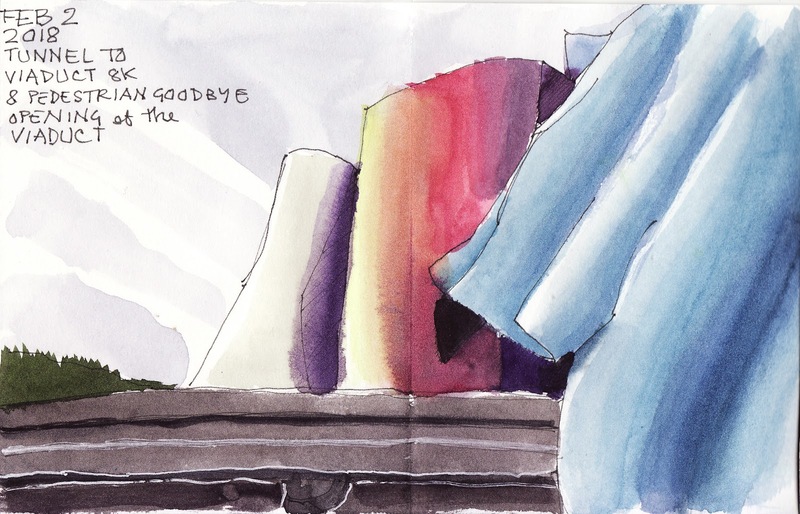 Her starts, stops, and breakages have entertained Seattleites since 2013. A giant image of Bertha on a building. The four yellow cylinders are the tunnel's ventilations stacks. 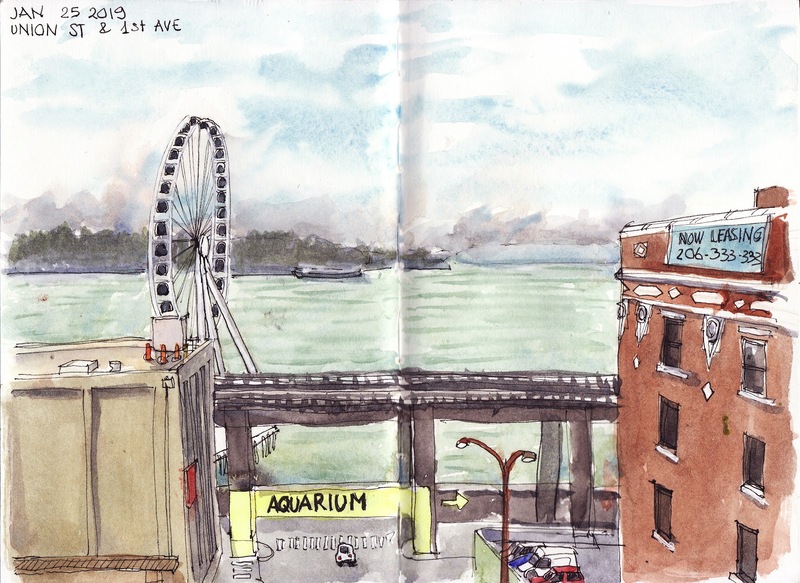 Raindrops create the mottled effect on the sketch. So Seattle. It was starting to drizzle and I was cold and tired. Time to go home.